Woe and death can turn a profit. Warfare needs a wealthy prophet! Woe and death through war, don't stop it! It's war that makes men rich! Woe and death can make for profit. Buy a bomb and then go drop it! War's a racket, but don't stop it! Nobel prizes fail to stop it! War's foundation? We've co-op'd it! 7 pages, circa 4' 00"
The melodic refrain which is so well known figured in many songs of the era, as the above from a turn-of-the-century hymnal. The Twain version (to which I have added refrain lyrics) is cited in "Major problems in American history : documents and essays," edited by Elizabeth Cobbs Hoffman, Edward J. Blum, Jon Gjerde, Wadsworth Cengage Learning, 2012, according to a Wikipedia article on the text. It is a complaint about the Philippine-American war through the satiric pen of Mark Twain. His lyric parodies the 1861 lyric of Julia Ward Howe, and the tune is most often said to be the work of William Steffe, from 1865 though several songwriters in that timed claimed authorship. The text has a subtitle which reads: "(otherwise known as The Battle Hymn of the Republic (Brought Down to Date), 1900." Given the revelations that a Democrat administration led by a Nobel Peace Prize winner whose ex-Secretary of State seeks to be elected president has outdone the previous Republican administration in arms sales (as well as cross-border attacks in many nations over seven years after the Bush administration, all the while playing the "peace" party spiel), the setting of this text by Twain carries an excerpt from a news item to that effect. For more on this, please see A Modern Observation on The Anti-War Movement, Revisited - "All we are saying is give peace a chance." How apt therefore to revisit this text from a century now past to find the same concerns and the same stance as one thinks on Twain's phrases, "let men die to make us rich — Our god is marching on." For other settings of texts by Mark Twain, click here . The criticism of government has been as historic as has been rock-solid proof of endemic government Corruption . While the loyal party zealots of both sides shriek with passion when such corruption is found in opposing politicians and wail in pretense when found in their own, there is a fine American tradition of criticizing government itself in rhyme. One finds this in the work of Ambrose Bierce, in his A Rational Anthem and Election Day . One finds something similar in Hilaire Belloc's On the Death of a Politician , as in Abraham Lincoln's We all declare for liberty . In Carl Sandburg's all-American hands this records Sobs En Route to a Penitentiary , and most clearly in Government . In the words of Walt Whitman's To the States as in Mark Twain's The Tyranny of Party , a deep and often warranted skepticism of government is found. 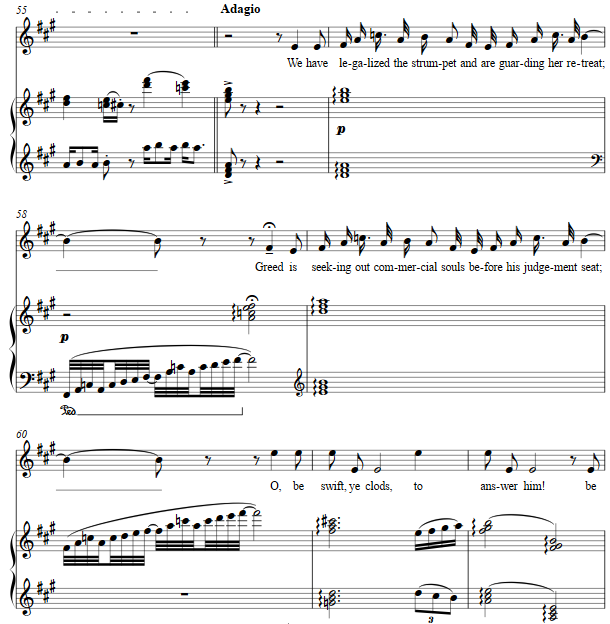 The setting begins with falling thirds major thirds, which then continue as a part of the accompaniment adapted after Steffe's well-known setting. 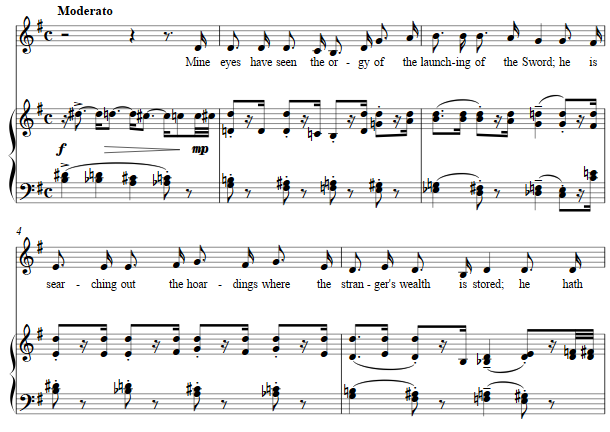 Another melody sneaks into the setting, a snippet from "The Gold Diggers' Song," by lyricist Al Dubin and composer Harry Warren. The musical quote is meant to reference that lyric which cheers, "We're in the money!" The verses and refrains, begun in G major yet thoroughly chromatic as a harmonic counterpoint to the famous melody, follow in succession moving to A major, with this next verse as below taken as a "riff" for the voice in a recitative-like break from the hymn. 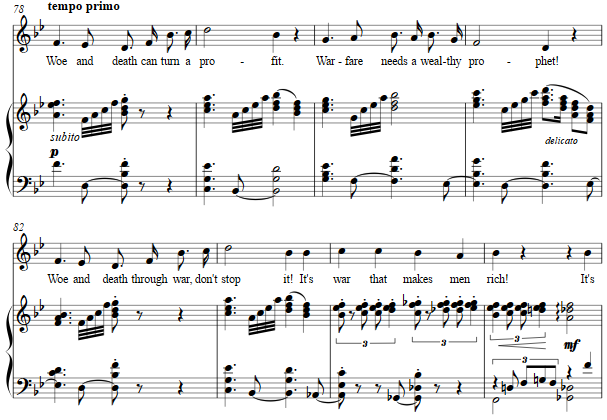 The last key change brings the setting into B flat, and the refrain then accelerates into a short final repetition of the clear-cut statement, "It's war that makes men rich!" As per the news items mentioned, and one included in the score itself, the truth is that it proves war "makes men" and women of ostensibly opposition parties rich indeed. Thus has it been since the time of Twain's parody until this parody for today.